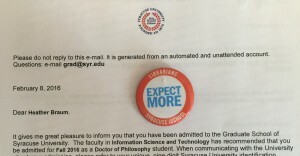 I’ve been accepted to the Ph.D. program in Information Science & Technology at Syracuse University for Fall 2016 admittance, which means I’m moving to New York in early August. I am incredibly sad to be leaving NEKLS and the Kansas library community, especially after spending the first nine years of my library career here. But, the Kansas library community has inspired me to take this next step in my career. In fact, the work and research that I hope to be doing is FOR this very special and dear-to-my-heart library community. Although research paths do change, right now I am planning to focus my studies and research on learning how to show the impact of small and rural libraries and librarians upon their communities (did you know 80.5% of public libraries are considered small and rural?). I am already hoping the Kansas library community can factor largely into this research and outcomes. 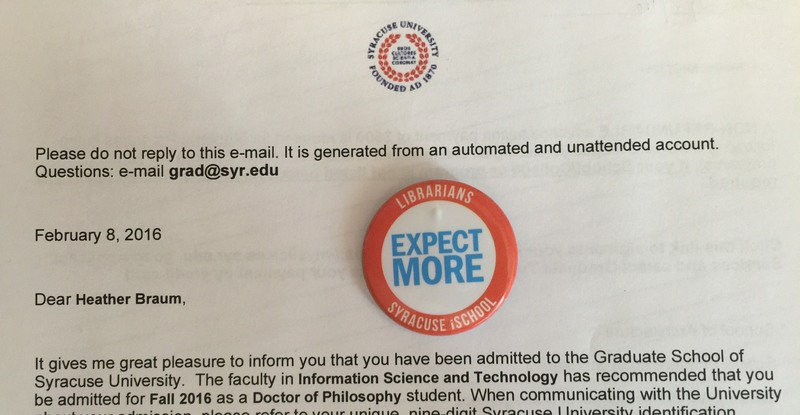 There are many great faculty and students at Syracuse, including the MLS program director, Jill Hurst-Wahl, who kindly sent me the “Expect More” button last summer that I laid on top of my acceptance letter in the above photo. I’ve carried that button around for months as a reminder, to expect more of libraries and of myself. That button was a nice reminder last fall as I wrestled with the question of what was next in my career. Many people have asked me, “Why Syracuse?”; I also had to address that question in my application. Syracuse is a great school with a great reputation (although, my college basketball allegiances won’t be swayed!) and the iSchool’s PhD program has a multi-disciplinary approach, which is attractive to me. But the biggest answer to “Why Syracuse?” is because of Dr. R. David Lankes. His theory of new librarianship, “The mission of librarians is to improve society through facilitating knowledge creation in their communities” is an important frame of reference for the future of the library profession. I look forward to studying with him and other faculty at the iSchool and University. Yet again resurrecting the old blog… Not much time to write these days. I am not a literacy theory student or a certified teacher. I’m a librarian — a systems librarian these days, to tell the truth. I manage a consortial ILS these days (Koha — hooray! ), but questions like what Buffy Hamilton raised on Twitter tonight get me going and make me temporarily stop digging through mySQL databases or tickets or testing or email. Buffy’s sponsors of literacy posts at the DMLCentral blog have been very thought-provoking. Is it another form/variation of Graff's "literacy myth"? Why do we expect every person will "fall in love" w/ reading? I will try and fully articulate these wonderings in a blog post soon—it's something I've been contemplating for a while. One other thought–interesting how books are the privileged medium of reading & other kinds of "texts" are not. Not new but still relevant. @buffyjhamilton it can be an article, or text snippet, or even your tweet. Hehe. Also didn't we used to be a fully oral not written culture? @buffyjhamilton which leads to a question. What is the end goal of reading, of literacy? Can it only be achieved through a traditional book? And that’s when I decided to write this post, the first in many, many months. Twitter’s character limits got in the way, and I have too many thoughts crashing into one another and they need to be shared. Bear with me just for a moment. Again, I am not a literacy expert — the little I know solely comes from reading and listening to Buffy’s lines of thinking these days. I am not a certified teacher, either, so please don’t get all over me if I say something wrong or unkosher. This conversation and numerous other mashed up discussions from the day (over stats, of all things!) has me questioning why people get so caught up in the container of what really matters — the STORY. A newspaper has a multitude of stories. A website is full of them. Graphic novels — ever read March?? Books — obviously (what about the different platforms of books?). And I’m getting side tracked. to carry out a task? I’d argue the end goal of literacy, of reading, is all of those and much more than I can think of right now. A piece of music — sung or played? And again, so much more. All of these? They are telling stories. So why, do we simply recommend books as the normal medium to help people discover the joy of reading? Instead, what if we started asking people what story they want to find or learn or seek out and provide the possible mediums to that story? What if, by coming to where people are at — helping them find the stories they want to discover, they can be introduced to all types of literacies – and learn and grow — and not simply shut down, because “the right book” — the right container — couldn’t be found? Do people still need to learn to read? Yes! The basics still need to be taught. 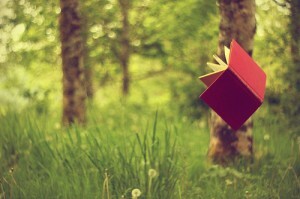 You grow through reading different variations of literature, and gain understanding of the world. But there was a reason this commerical’s story happened. And it wasn’t to fall in love with reading… The main character had a story he wanted to read, and to get there took a lot of work and a lot of different containers to learn to read, before he came back to the first story (I’m being deliberately vague, in case you skipped the video). I may unpack this further. Or it may stand alone, as a simple thinking out loud exercise. What do you think? Maker Faire KC 2012 Slideshow from Northeast Kansas Library System on Vimeo. Maker spaces (or hacker spaces), maker programs, maker collections, maker events, and maker faires are beginning to become more widely acknowledged. I had heard about them many times, at DML 2012 in San Francisco (where I learned about Pittsburgh, PA’s MAKE SHOP at the Children’s Museum), in articles about libraries embracing this maker culture, including Fayetteville Free Library’s Fab Lab, and in conversations at work and with colleagues. Lifehacker has been a go-to resource for years! As I texted a friend, this maker culture “screams” for libraries to be present. Libraries have the resources available for people to access (quilting stencils, knitting books, woodworking, car repair manuals? ), libraries already provide some programming around the maker culture (altered books, knitting clubs, candlemaking, duct tape), and in many cases, we have areas that these people can use to meet and create. One library has gone as far as housing a hacker space on site! What did we see in KC? Robotics. Food. Woodworking. Crafting. Knitting. Literally making objects with a 3D printer. Costuming. Cardboard. Legos. Battery-operated lawn mowers, run by drill batteries. Touch screen light walls. Duct tape. Sand. Music. Electricity. Metal. Gardening. Anything can be made with anything. 3D printing is one of the “hottest” parts/harder to understand part of the maker culture. Librarian Jason Griffey interviewed the MakerBot CEO in January about 3D printing and libraries (MakerBot is a 3D printer company.) Jay Leno uses a 3D Printer to make “new” car parts for his “old” car! Want to gain an understanding of the real-life potential of 3D printing? Watch this TEDx talk on possible 3D printing use in medicine. People want to make things, but in many cases, don’t have the garages to build out of anymore or the workshops to use. They may not have the money to buy the tools or access to people who “Know” what they’re trying to make. Libraries can connect these people together. People want to tinker, learn, make things themselves. Makers also want to be able to display or show off their work — libraries could also provide space for community members to show off their work — I’m sure many are already doing this! What excites me greatly about this idea of the maker culture intersecting with libraries is beginning to rethink what learning is and how people learn. John Seely Brown and Douglas Thomas published a book in 2011, A New Culture of Learning, that examines how learning is changing, especially in classrooms. John Seely Brown was interviewed last month at a Maker Faire in San Mateo, CA about this idea of tinkering and DIY culture. Brown’s longer keynote at DML 2012 on Cultivating the Entrepreneurial Learner in the 21st Century expands on these ideas. 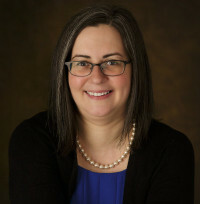 Before sharing several videos and a slideshow from the day, here’s one other video to watch, a talk given by Ann Marie Thomas, PhD at the KC Maker Faire, on the Maker Education initiative. In the talk, she mentions libraries as potential partners. I am very interested in watching what comes of this Maker movement and how libraries can become involved, whether it’s giving space to a group, providing time for programs by makers and creators, letting them lead classes for the library’s community, housing makers’ work in displays, hosting sets of materials to “make” things with, a 3D printer, sponsoring a robotics competition or team, or ideas not even created today! Here’s a video slideshow from several videos I “shot” at the Maker Faire during a robot-shooting-basketballs competition for high school students (4 videos), a touch screen lights display (its dark and hard to see the people, but the real action is on the wall), model roller coasters from Worlds of Fun, a paper tube rocket launcher, some sort of Middle Earth fighting sequence (? ), and 4 videos from the group Arc Attack — you have to see this group to believe it! Thanks to Liz and her son for letting me tag along and for her ideas around this topic. She’s gotten many of us excited at work about the Maker movement’s impact upon libraries. I’ll break the list into four groups. Books are linked to either the record in the NExpress Shared Catalog (the Koha regional catalog I help manage at work) or the Amazon.com record, unless otherwise noted. My college advisor rec’d this six years ago, I’m determined to get this read, still. Photo Credit: “This Paper Trail Leads Right Back To You ~ Explored” by Flickr user Bethan under a Creative Commons license. Ed Tech Master’s Degree: One Semester Completed! I started yet another grad school journey this summer in June, beginning the Master in Educational Technology online program through Boise State University. I’ll also be completing a graduate certificate in Online Teaching for Adult Learners along the way. The summer semester pretty much kicked me in the rear end — I don’t necessarily recommend taking 6 hours, right off the bat, in the summer semester, while working full-time. But I survived, had understanding co-workers, learned my limit, learned how to cope again with lack of sleep and full brain. The projects, reflections, and readings of the program have all confirmed that this path was the next correct step in this journey called life. If you want to follow my journey of learning, feel free to check out and read my Ed Tech Learning Log, a required blog for reflection on the classes I’m taking to help build a portfolio at the end of the program. I may occasionally cross-post here, but more often than not, will keep the two blogs separate. Also, I designed and completed several learning activities for the Internet for Educators course (web design), which can all be found through this homepage. I designed many of these with a target audience for the librarians I work with. My goal from the ed tech program right now is not to end up in a classroom with K-12 students (not certified, anyway), or even a college classroom. It’s to continue working for an organization like where I’m at right now or another continuing education or professional development organization, developing training using online learning and blended learning tools. Or, it could be in Higher Ed working with faculty to develop online learning/blended learning/technology integration. Also, the library is about lifelong learning. I’m hoping to learn ways to incorporate ed tech concepts into libraries to reach patrons at whatever learning level they want to be at. Finally, one surprise from this program has been resurrecting my design skills that have remained dormant since high school web design and newspaper days. I still have a lot to learn, but it will be interesting to see what I get out of instructional design this fall. I sure enjoyed designing the final two projects in the web design course!